University employers have made a final offer of 1.1% increase on all points from 1 August 2016, with additional payments at the lower end of the pay spine. This offer includes the deletion of point 1 to be implemented by 1 April 2017, and an increase of 3.1% on point 2 with tapered higher increases through to 1.6% on point 7 from 1 August 2016 (see table below). The lowest pay spine point from April 2017 would be £8.25 per hour for employees on a 35-hour week. 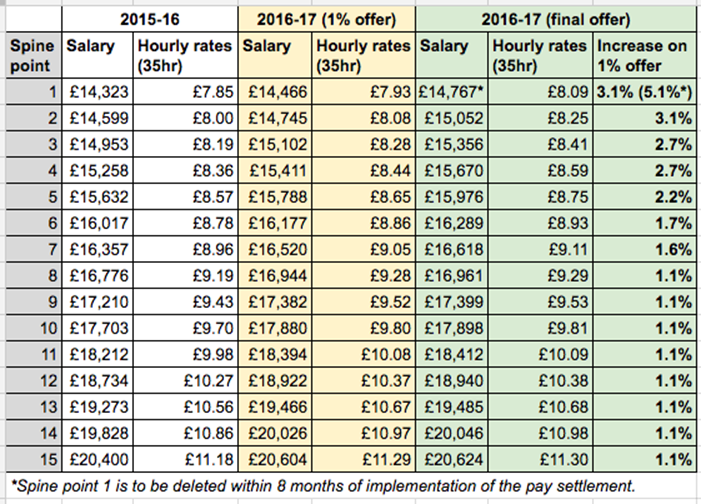 On London Weighting, the offer is 1.1% for post-92 HEIs that retain a separate allowance. The employers have offered further joint work on gender pay and casualisation. UNISON’s HE service group executive will be consulting members shortly. This entry was posted in Pay by Admin. Bookmark the permalink.